Now, we can talk about the verbal section. 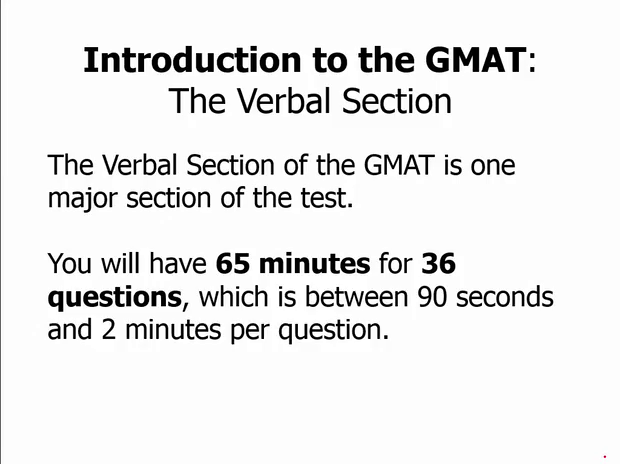 The verbal section is one of the major sections of the GMAT. In fact, verbal and math together, account for the full GMAT score. You will 65 minutes for 36 questions, which is somewhere between 90 seconds and 2 minutes per question. So you have to keep a pretty good pace. These are three question types, reading comprehension, critical reasoning, and sentence correction. You'll see about 11-13 of each question type, and all of these are in 5-choice, multiple-choice format. I will say we have entire lesson modules explaining these in detail. Here, I'll just give the briefest of introductions to these three types. Reading comprehension, this is probably what you expect, probably the most standardized test you've taken since before puberty, have had a reading comprehension section. They give you a ring passage, they ask you questions on it. On the GMAT, the subject areas are Physical Science, Life Science, Social Science, and Business. And it's roughly split about evenly between those four subject areas, and these are relatively challenging topics to read. The passages on the GMAT are, in many ways a hair more difficult than most reading comprehension passages on most other standardized tests. So it's important to practice this. Especially if you're not someone who likes to read a lot. Critical reasoning, this is about the analysis of arguments. So they'll present an argument, it might be a very sound argument, it might be an argument full of holes. They'll present some sort of argument and then they'll ask you a question about it. What would strengthen the argument? What would weaken it? How would you evaluate, etc, etc? And so again, several questions that's about argument will discuss this in the critical reasoning section. Finally, the sentence correction sentence. This present a sentence with an underlined phrase, that may or may not be correct, it may or may not contain grammatical errors, logical problems, etc. And the choices present alternatives to the underlined part, and you have to find the best way to phrase that to make the whole sentence as correct and as meaningful as possible. The GMAT sentence correction test grammar as well as logic in what's called rhetorical construction. And we'll discuss all of these in the sentence correction module. So now we can talk about an overall strategy. Individual questions have individual strategies that we'll cover in those lesson modules, but there is a magic one word piece of strategy that can improve your entire verbal score. And that is quite simply, read. The more you can develop a habit of reading, and in particular reading the kinds of things that you'd need to read the business world. What does a business executive need to read? Well, they need to be caught up with what's going on in the business world, so they need to read business news, read the economists magazine, read the Financial Times, read respected publications about business news, read journal articles. All of this would be important and in fact, it's important even to push yourself to read topics about which you are unfamiliar. So you're getting this sense of building vocabulary. You're also noticing arguments that are happening, and you're even noticing the construction of individual sentences. All of this will help you when you come to the verbal section.